The Weizmann Institute of Science and the University of Oulu jointly organised a hands-on workshop that was focused on the practical aspects of Remote Data Collection using the Macromolecular Crystallography (MX) Beamlines at the Diamond Light Source (DLS), Oxford and the European Synchrotron Radiation Facility (ESRF), Grenoble. This was the 1st SESAME scientific workshop held in Israel, 14-18 May 2018 at the Weizmann Institute of Science. 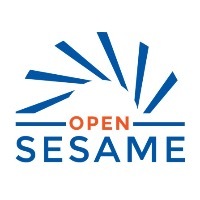 It was supported by the EU projects OPEN-SESAME, Instruct-ERIC, The Weizmann Institute, The Israel Academy of Sciences, FEBS, MiTeGen and Molecular Dimensions. · Examples of remote data collection with test ‘demonstration’ crystals and crystals supplied by the participants. · Introductory lectures on crucial aspects of data collection were conducted throughout the workshop. · All participants had a chance to do remote data collection using their own crystals and/or test crystals that had been shipped to Diamond and/or ESRF, prior to the workshop. The entire workshop was streamed live on the internet for those who were not able to make it in person. Details of the program, copies of the lectures and photos of the workshop can be found at the workshop's website. Figure. 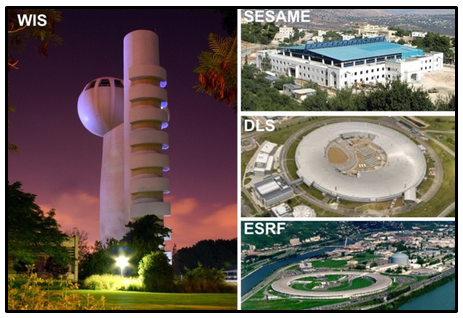 The venue of the workshop at the Weizmann Institute of Science (WIS), Rehovot, IL, the SESAMESynchrotron in Allan, JO, the Diamond Light Source (DLS) in Oxfordshire, UK, and the European Synchrotron Radiation Facility (ESRF), Grenoble, FR.